The USA District is proud to announce the acquisition of a "new" church for its mission in Pittsburgh, Pennsylvania! The church building in question is the former diocesan St. James Church, closed ten years ago in 2004. We offer from the pastor, Fr. Patrick Rutledge, the article below detailing some historical background on the Pittsburgh area chapel (presently located in the suburb of Carnegie) as well as the various attempts to obtain a more suitable facility. Featured below the article are some images of the church as it appears today (as an art center) and two historical images. Seventeen years ago the Society of St. Pius X purchased a school building in Collier Township, just west of Pittsburgh, which as a Mass location is known as Our Lady of Fatima Church. Although the school building was in a pleasant location and had ample classrooms and land, Mass had to be celebrated in the old gym of the school. The parishioners and benefactors did their best to make it as worthy as they could for the Mass, even buying the famous Beuronese murals which decorate the walls of the gym. But for a Catholic who knows the dignity of the Mass there is always the desire to own a proper church. Further, the demographics of the parish changed a great deal in those years after 1997 with a growing parish and many children entering the catechism program. Therefore it was decided a few years ago to start looking for a proper church for the sacrifice of the Mass. The search began, but it was not going to be a quick job since God works in eternity and not time, despite what we often wish. His Divine Providence would lead the chapel through many twists of events and vexing endeavors in dealing with the Diocese of Pittsburgh. In 2007 the search began under Fr. Scott Gardner, and one parishioner, Walter Viola, was especially helpful in trying to locate properties. The first property that seemed feasible was a closed Catholic church, St. Canice, in Knoxville-Pittsburgh. A shell buyer attempted to purchase it for the Society, but word came to the diocese that the SSPX was behind it and a lawsuit ensued against the shell buyer, who eventually settled with the diocese. Five years later the diocese sold the church to a Protestant group—the Lion of Juda congregation. In the meantime, the number of baptisms at Our Lady of Fatima increased, while the number of funerals decreased. Marriages were celebrated, First Communions and Confirmations kept growing, while the search went on. In 2010 another Catholic church appeared on the radar which had been closed due to yet another multi-parish merge in the diocese. The church was St. Michael’s, a beautiful edifice built by the Slovakian immigrants of Munhall in the 1920’s. The borough of Munhall was a steel-mill, working-class community along the Monongahela River, which degenerated after the steel mills closed in the 1990’s. If there was anything unfavorable about buying this church, it was the cross-city commute it would mean for some parishioners and the fact that the area was just beginning to re-gentrify. The church, however, with its double choir loft and marble baldachin would have been a perfect home for the Society and the Roman Mass. On top of that, Mr. Viola was able to buy the adjoining convent, rectory and school that had belonged to the parish which would potential provide space for catechism and a proper place for the priest to live—a step up from the in-school bedroom/office that the priest used at the current school building. Further, the mayor of the borough of Munhall was very favorable to the SSPX. Even though he did not attend SSPX Masses, every year he allowed the SSPX Rosary March to go through his streets in Munhall and even led the way in a police car at the front! There was one problem with St. Michael’s—the diocese owned it! At this point, the District Superior, Fr. Arnaud Rostand, made an appointment to meet with Bishop David Zubik, the local ordinary of Pittsburgh. Fr. Rostand came “hat in hand” along with Senator Michael Dawida of Pennsylvania to ask up front and openly if the bishop would sell us St. Michael’s for the $350,000 they were asking. However, the bishop had invited the Fr. Lawrence DiNardo to the meeting. Interestingly, Fr. 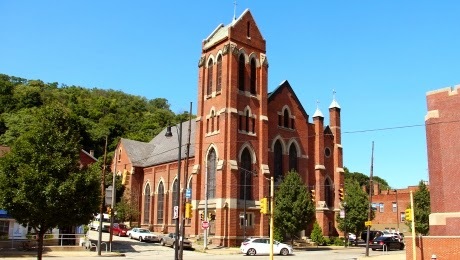 DiNardo was also pastor of Holy Wisdom Church where the Pittsburgh Latin Mass Community organizes a weekly Mass, at that time attended by nearly 1,000 faithful. Of course Fr. DiNardo would be favorable to another traditional Mass group buying St. Michael’s from the diocese and extending the Mass of All Time to another part of the city, right? Wrong! Fr. DiNardo insisted that the SSPX was schismatic and that therefore the bishop could not sell it to us. So much for religious liberty and ecumenism. Bishop Zubik had told Fr. Rostand during the meeting that if he could obtain a letter from Rome allowing him to sell the church to the SSPX, then he would do so. So, for the next few years anything that could be done was done to acquire the church. A letter was written to the Pontifical Commission Ecclesia Dei explaining the desire to buy the church and acknowledgement of receipt came from Rome in August 2011 with a protocol number. Yet nothing was ever heard from them again. Another request was made to Rome in 2012. Bishop Joseph Di Noia told Fr. du Chalard to have more information sent to him on the Pittsburgh matter and thus Fr. Patrick Rutledge, pastor of Our Lady of Fatima, wrote another letter in October and confirmed that it was hand-delivered to Archbishop Joseph Di Noia. Yet again, nothing ever came of it. I would wish for nothing more than to once again see the procession of the Blessed Sacrament coming down 9th Avenue from St. Michael’s Church proclaiming the faith in Christ the King as our ancestors did. Can you help me in this regard? The only result of this was that the diocese added encumbrances to every deed of sale stating that the church could not be used “as a church, shrine or for any type of religious worship,” and making this encumbrance perpetual. How could one sell a church and yet legally prohibit its use as a church, unless one is doing everything to keep someone from buying it? Precisely! It was almost as if they wanted to see it crumble to the ground. By fall of 2013, as the diocese was laying off employees due to a $2.3M deficit in their budget, the price of St. Michael’s had dropped down to $150,000 despite the readiness of our checkbook. At that time a local reporter contacted the diocese about the sale of St. Michael’s and asked why the diocese had previously sold churches to the Lutherans and Baptists while they would not sell to the SSPX. The response that was posted in the newspaper was, “those groups [Lutherans and Baptists] are not schismatic in the eyes of the Church.” What a losing battle this was! There was no use trying to reason with the diocese. It became clear that they might sell this church for Protestant “worship” or to a developer for making apartments, but not to a group that would use it according the purpose for which it was built—the Mass of All Time and the perennial teaching and sacraments of the Church. After all of that work there was still no solution to the search and the attempt to get out of the school building. In the meantime, the roof of the school building at the SSPX chapel began to leak like a sieve. Further, a cold weekend in the 2014 winter led to a pipe bursting in one of the classrooms, which flooded the room and ruined the flooring and many of the objects in the room. If ever there was a time to move, it was now. 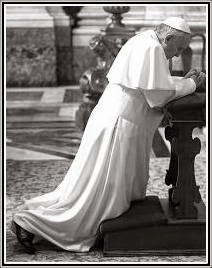 “How long, O Lord, dost thou keep our souls in suspense?” What was the result of so many prayers and efforts? Nothing, nothing, nothing! But God is the expert at bringing something out of nothing. The parishioners of Our Lady of Fatima offered a month-long novena to St. Joseph in March of 2013, asking for the light and grace to do the will of God in finding a new church. On top of that, devotions to Our Lady of Perpetual Help, which are held at the chapel on the last Sunday of every month, started being offered for the intention of acquiring a church. The pastor also offered his youth pilgrimages of 2012 and 2013 for the intention of finding a new home. He had prayed at Santiago de Compostela and Lourdes for Providence to guide the search for a church. But as Providence always does, He waits until we either lose hope or take another direction before He steps in and shows that He is in control. Could the prayers offered at Santiago have been answered? Wait, what was the name of this church? St. James? Let’s go take a look! It was a beautiful church, well-kept, clean and able to be used as-is. But who owned it and were those diocesan encumbrances in the deed? According to locals who knew the owner, he was not accustomed to selling any of the many properties that he owned. But on the feast of Our Lady of Lourdes, Fr. Rutledge planted Miraculous Medals in the corners of the building. After all, prayers were offered to her at Lourdes as well. A few days later, when the idea of selling the church was mentioned to the owner for the first time, he immediately signed a purchase agreement for $775,000, despite the fact that he was still using the church for an art gallery and had invested $1.5M in the church. Fortunately the church had been sold in 2004, long before the diocese was aware of the SSPX’s attempts to purchase churches. Therefore the deed was free of those encumbrances that had prevented the previous purchases of churches. St. James was an old church, built in 1854 when the Dogma of the Immaculate Conception was declared and now, the Immaculate Conception, the Woman of Lourdes, was helping her children find a home. Even though it took months of legal work to make clean the title of the church, Our Lady set another great feast of hers as the date for closing on the church. Lawyers kept promising since March that we would close soon. Finally, after months of such promises, the lawyers set August 15th as the closing date. From the feast of the Immaculate Conception in 2013 to the feast of the Assumption in 2014 Our Lady led us from assuming the impossible to owning a church. What a testament to her power and the reason to hope in her. This was clearly a work of Our Lady and of Divine Providence since God was accomplishing so easily what years of calculated efforts could not attain. A procession was promised to Our Lady should this deal go through and now it is done. All that is left is to give thanks for the wonderful work of God who sees all things from above and orders them in due time. Now, after years of searching and discerning the will of God, He has made His holy will clear. The Society of St. Pius X’s presence in Pittsburgh will now move ten minutes closer to the city and into a proper house of God. The Society’s work will continue to give the faith and sacraments of all time, but now a real church will be an apologetic tool for the salvation of souls in Pittsburgh and in the West End. Processions will now go down the streets of a small community that once bragged of two Catholic parishes, of which neither remain. St. James is coming back, even though it was abandoned ten years ago as a result of the fruits of Vatican II. St. James will remain the name of the church and parish to show that the SSPX is Catholic and wishes for nothing more than to be Catholic and to pick up and continue what modern churchmen have left to crumble. With a parish that has grown from 220 to close to 300 souls in the past few years, with a rising generation of young Catholics and families, with the recent confirmation of 55 new soldiers of Christ, with an apostolic youth group, the SSPX now “doing-business-as” St. James in the Pittsburgh area, hopes to continue to increase the work of Christ the King in one of the most Catholic-populated cities of the United States. Adveniat regnum tuum! See more photos and videos by clicking here. 1 Fr. DiNardo is Vicar for Canonical Services for the Diocese of Pittsburgh and cousin of Cardinal Daniel DiNardo of Houston, TX. 2 President of the Pontifical Commission Ecclesia Dei. 3 An SSPX priest now stationed at Albano, Italy. 5 Fr. 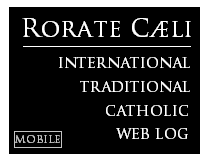 Rutledge chaplains a youth pilgrimage to Catholic shrines in Europe every year. 6 Lawyer and organizer of the annual Catholic Identity Conference in Weirton, WV. 7 Santiago means St. James.